While Anfield’s new Main Stand was officially opened in September, there’s still plenty of work being done on the wider regeneration of the stadium and the area. Work continues on the internal areas of the stand, with temporary changing rooms and media facilities in place at present. Initially, these were due to be completed in January, but these are now due be completed in time for the Merseyside derby on April 1. The new changing rooms will feature USB and power points, with personalised, removable name panels. Some of the senior players were involved in the consultation of the design. Elsewhere, the initial plans were for a new club shop, but that will now be external (see below), meaning a large space is now available. This could possibly be a new car park for players – who currently park behind the Centenary Stand. Rather than locate the new club shop inside the Main Stand, Liverpool have begun work on a new external club shop and cafe – similar to the one at Borussia Dortmund. The new store will be four times the size of the current shop, which is located within the Kop, and is due to be open early next season. A decision will then be made on what is done with the existing shop. With new disabled access and vantage points being installed in the Lower Centenary stand this summer, Liverpool will add around 470 new seats at the back of the Kop. It means the overall capacity won’t change, but it will add to the Kop’s size and noise – taking the Kop’s capacity to just under 13,000. Outside of the Main Stand, on 96 Avenue, there is work still to be done on the finishing touches, including the placement of ‘Anfield Stones’ – which fans have been able to purchase. There’s also plans for granite benches to be added and artwork displaying some of the iconic moments and players from throughout Liverpool’s great history. The project is called “The Men who Built Anfield”, with the likes of Steven Gerrard, Kenny Dalglish, Bill Shankly and Bob Paisley to be commemorated, among others. The new Main Stand is part of a wider regeneration plan for the area, and houses on Walton Breck Road continue to be demolished by the council as they work towards a radical transformation of the areas. New shops, commercial units, homes and apartments are planned, as well as pedestrianised areas and a new vision for the high street itself. It should further transform the local area. “The 100-bed hotel, once completed, would ensure that Anfield becomes a destination of choice for many visitors, who have the ability to stay in the area and explore the other facilities on offer, reintroducing revenue into the area and enabling it to remain sustainable. No dates or timescales have yet been announced regarding the hotel’s development. 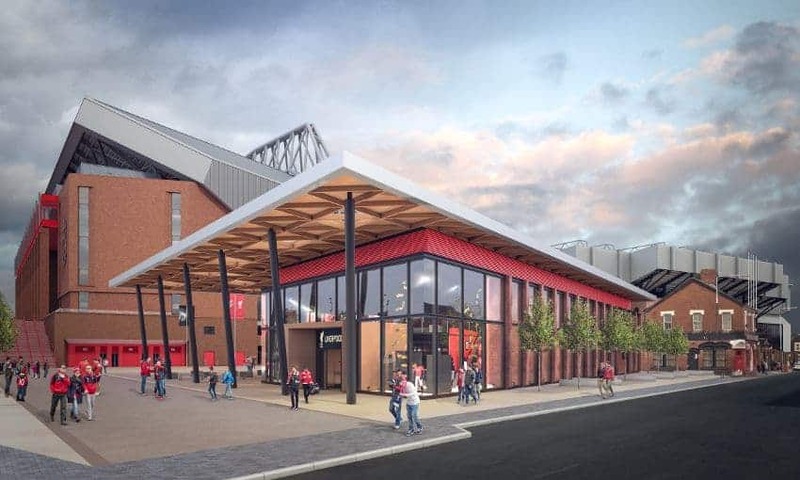 Last, but certainly not least, is phase two of the overall stadium expansion – the redevelopment of the Anfield Road End, which would take the overall capacity to around 59,000. Phase two has never had a planned start or completion date, but the club currently have outline planning permission, which has been in place since April 2014. 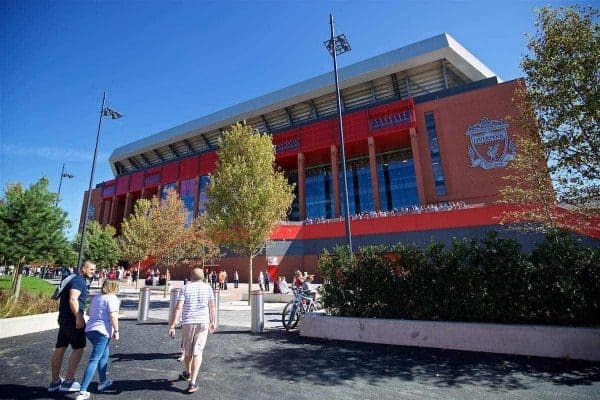 Liverpool always explained that a decision on the expansion of the Anfield Road End would be made once the Main Stand was complete and dependent upon factors at the time. That continues to be the case today. The expiration date of the outline planning permission is September 2017, which means Liverpool have until then to submit a further application with more details on the design, or the outline approval would expire. If Liverpool submit the additional application, they then have two years to commence building, meaning construction on the Anfield Road End would be needed to be started by late 2019 or earlier. It would also see Anfield Road the road itself closed off, and the away fans moved back to the other corner of the stand, nearer to where the away coaches arrive on Arkles Lane. There has been talk recently, including at at the most recent supporters committee meeting, of Liverpool now looking at a capacity of around 62,000. An announcement later this year would be nice. * There are still a limited number of the old Main Stand seats available to buy from the official LFC club shop here.